Dance Changes Lives. Your Donation Makes it Happen. Canada's National Ballet School believes that everyone deserves the opportunity to enrich their lives to the fullest through dance. Whether pursuing a career in ballet at the highest level, moving creatively in the classroom, or dancing for fun and health as we age, financial circumstance should never be a barrier to accessing high quality dance programs. When you donate to NBS, you open doors for thousands of Canadians - and people from all over the world - to live more creative, active, and fulfilling lives through this profound and universal art form. Dancing connects people emotionally, spiritually, and culturally. Dance promotes better health through movement. Young people should never be denied the opportunity to pursue their excellence. That's why NBS' Sharing Dance community programs are free, opening doors for children and youth to discover skills they didn't know they had. It's also why NBS' renowned Professional Ballet/Academic Program accepts students on the basis of their talent alone. The training of all students in the professional-track program is heavily subsidized, and more than 80% of families require further financial assistance to cover the costs associated with tuition, residence, travel, and other expenses. Nearly $3 million in student financial assistance was required last year. Through the generosity of donors, NBS' Sharing Dance for Children & Youth, and Sharing Dance for Adults & Seniors are completely free for all participants - from school teachers accessing NBS lesson plans and video resources to incorporate dance in their classrooms, to seniors in remote communities using NBS' livestream technology to participate in customized dance workshops, to people living with Parkinson's disease and dementia participating in NBS-driven scientific research to understand how dance can help manage symptoms of age-related illnesses. Donors also provide critical financial assistance for students in the Professional Ballet Program, who are never denied entry to the program based on financial circumstance. From elite young dance artists to people of every age, ability, and aspiration - your donation opens doors for everyone to transform their lives through dance. 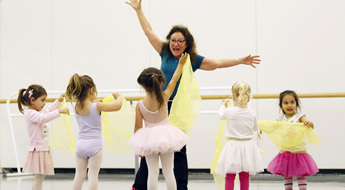 Canada's National Ballet School's Development Office is dedicated to helping individuals, corporations and government agencies find meaningful and mutually beneficial opportunities to become involved with NBS. Get in touch with us today. As a supporter, you are invited to take part in various events at the School throughout the year. Stay in touch with donor events with our quarterly TURNOUT: Spring Edition 2019.